exciting flourish that marked the culmination of years of dedicated development, and celebrate the release of our fantastic new cloud-based e-procurement solution. 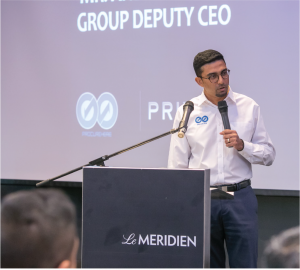 Procurehere played host to over 150 key stakeholders and valued partners for this momentous occasion on the 25th September, 2017, at Le Meridien, Kuala Lumpur. 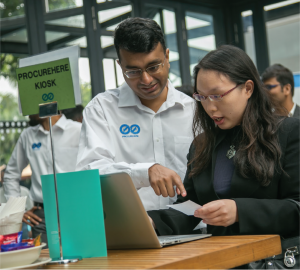 Guests were not only introduced to the cloud-based Procurehere Version 7.0, but had the chance to explore the software for themselves with our Procurehere experiential area. And with the help of key speakers from Procurehere’s management team, the audience were invited in to understand a little more about the exciting journey Procurehere has travelled to this point. Privasia has been delivering smart e-procurement solutions to clients since 2002, facilitating over US$1.2 billion in spend to date, delivering an impressive 17% average savings per event. After 15 years we understand that the greatest results come from the simplest solutions. Now Procurehere Version 7.0 is here to deliver on that promise. Six versions of growth have seen Procurehere’s functionality and opportunity developed to deliver an outstanding new e-procurement software. Version 7.0 emerges from over 2 years’ client consultation, alongside more than 18 months on-shore and off-shore development. With the insight we gained, our team of over 150 extraordinary IT professionals developed and delivered a simplified e-procurement solution that enables significantly increased efficiency and cost savings for our customers. Procurehere Version 7.0 is an evolution in both capability and opportunity. This new cloud-based offer empowers our customers to adopt a truly global opportunity for procurement, from the education sector through to construction. The launch of Version 7.0 marks a new stage on our journey to provide a platform which offers the capabilities and functions that our customers need, without prohibitive costs or limited by a need for comprehensive technical understanding. This is procurement software driven by the goal of delivering user-friendly solutions that are easily accessible and simple to use. This cloud-based platform requires no formal training, and no substantial capital expenditure. It does not require expensive IT infrastructure or punishing subscription fees. It can be set up anytime, by anyone, anywhere, in just 3 days. With the launch of Version 7.0, Procurehere set out our vision and ambition. This is a company born in Malaysia, ready to take over the world.